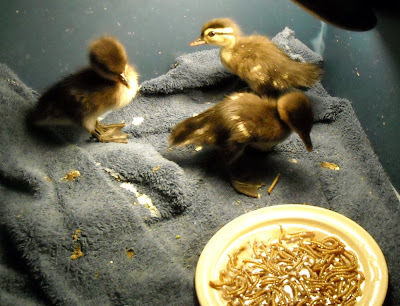 ( Photos: Hooded Merganser Ducklings are about half grown in this photo. They are being raised with a Wood Duck duckling of the same age, also in the photo. Age of the ducklings is an important criteria when grouping hatching's. 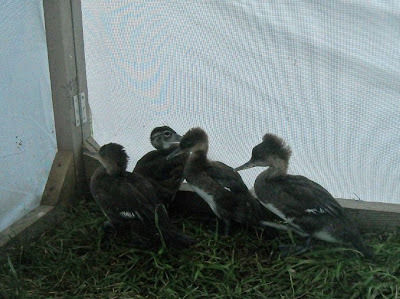 The Hooded Merganser ducklings that came into REGI just a month ago are about half grown these days. They are very shy guys. It is hard to catch them doing anything but hiding when we come into view. That makes taking photos of them challenging, but that cautious streak will serve them well once they are released to the wild. Both Hooded Merganser and the Wood Duck are some of the most colorful of the ducks in the wild. Mergansers are the fastest ducks in the world. We never get to see them in their adult plumage because they are always released in their juvenile plumage. But, that is fine with us. Once they can take care of themselves and have the skill to do it, they belong in the wild. The diet for both species is similar and that is aquatic insects, crustaceans, frogs and mollusks. No duck food for these guys. That makes them tough to raise and keeps us scrambling for food sources for them.